Alamo followers don’t appear at court hearing on property claims. Followers of Tony Alamo did not show for a court hearing Wednesday to address claims of ownership to properties in Fouke and Texarkana, Ark., that a federal judge has ruled can be sold. Earlier this year, U.S. Magistrate Judge Barry Bryant nixed claims to properties in Fouke and Fort Smith, Ark., made by more than 70 Alamo loyalists on properties associated with imprisoned evangelist Tony Alamo. However, Bryant said he is willing to consider additional evidence concerning the claims of two men whose names appear on titles for houses in Fouke and Texarkana. TEXARKANA, Arkansas — Followers of convicted evangelist Tony Alamo failed to attend a court hearing that was scheduled to consider their claims of ownership of Alamo ministry properties in Fouke and Texarkana, Arkansas. A federal magistrate ruled previously that the properties can be sold to help pay $30 million Alamo owes two men after a federal jury found that he ordered the beatings and other abuse of the men when they were children in his ministry, but scheduled a hearing on claims that members of the ministry are the owners. Twelve former members of Tony Alamo Christian Ministries filed a federal lawsuit this week seeking damages for alleged abuses they suffered as children raised in the controversial group. TEXARKANA, Arkansas — Attorneys for two men who are owed $30 million from a civil judgment against convicted evangelist Tony Alamo say properties owned by Alamo’s ministry have been stripped by his followers since a federal judge ordered that the properties be sold to help pay the debt. The Tony Alamo Christian Ministries church building in Fouke, Ark., and other properties have been gutted since a federal judge ordered their sale. “Plaintiffs have learned that certain fixtures such as air conditioning units, ceiling tiles, doors, sinks, commodes and insulation are being removed from the properties,” states a motion filed on behalf of two men owed a $30 million judgment from imprisoned evangelist Tony Alamo. A circuit judge in Miller County, Ark., ordered imprisoned evangelist Tony Alamo to pay more than half a billion dollars in damages to seven women he sexually and physically abused. An Arkansas judge has awarded seven women physically and sexually abused by evangelist Tony Alamo another $525 million, pushing the total owed by the imprisoned preacher and an affiliated church to more than $1 billion. Christhiaon Coie has spent 43 years waiting for the day when the brutal, Catholic- and gay-hating cult leader who she says raped her and numerous other girls, some of them as young as 8, would get his just desserts. The Alamo Ministries church in Fouke, Ark., and other properties can be sold to partially satisfy a $30 million judgment Tony Alamo owes two men raised in the controversial group, a federal judge ruled Wednesday. A federal judge in Texarkana has once again given the green light to sell Tony Alamo’s Fort Smith, Ark., church building to partially satisfy a $30 million judgment owed by the imprisoned evangelist. An Arkansas judge awarded $525 million this week to seven women who alleged they were sexually abused as children by former Christian ministry tycoon Tony Alamo, after the Alamo church failed to respond to a lawsuit, according to the L.A. Times. An Arkansas judge has awarded more than half a billion-with-a-B dollars to seven women who’d been abused by the child-molesting evangelist Tony Alamo when they were girls, and Alamo’s church property on Sierra Highway could end up footing the bill. A Miller County, Ark., judge awarded more than half a billion dollars in damages to seven female former members of Tony Alamo Christian Ministries this week. 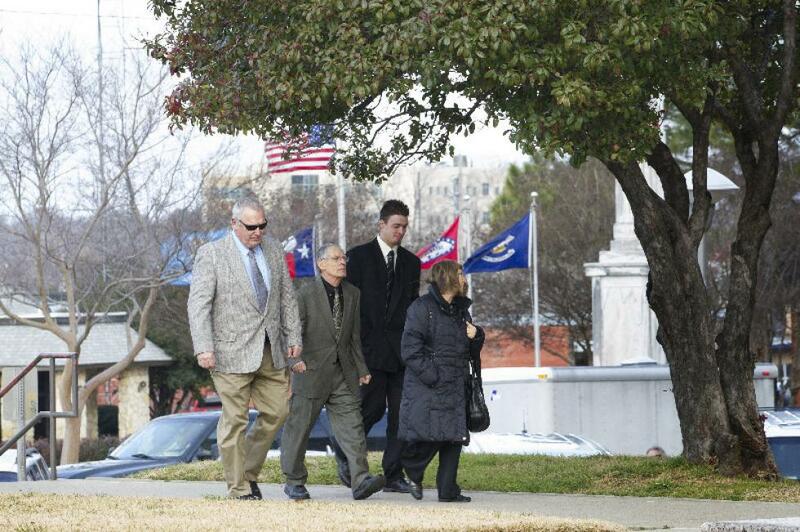 Staff photo by Evan Lewis The parents of Seth Calagna, one of two men owed a $30 million judgment by Tony Alamo, walk with other Alamo loyalists into the federal courthouse Wednesday for a hearing concerning properties in Fouke, Texarkana and Fort Smith, Ark. A federal judge heard from more than 20 followers of Tony Alamo on Wednesday at a hearing to address properties in Fouke, Texarkana and Fort Smith, Ark., that a federal judge previously ordered can be sold to partially satisfy a $30 million civil judgment Alamo owes. Properties associated with imprisoned evangelist Tony Alamo didn’t go up for auction last week as planned. Former Alamo members file suit. Seven women, all former members of Tony Alamo Christian Ministries, filed a civil lawsuit Tuesday in state court in Miller County, Ark., seeking damages for suffering they endured under imprisoned evangelist Tony Alamo’s control. A Tony Alamo Christian Ministries member received life in prison Thursday for sexual misconduct with three young girls whose mother was a ministry member as well.